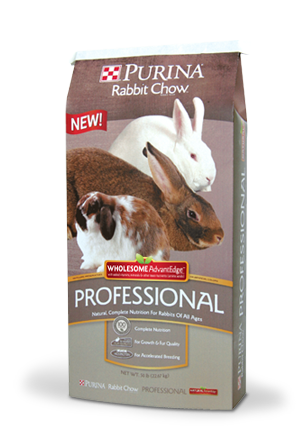 Purina Rabbit Chow Professional Wholesome AdvantEdge is completely balanced food specially formulated to promote proper development, vibrant fur and reproduction. This nutrient dense formula is our highest protein and highest energy rabbit food, making it a great choice for those who desire to augment breeding and/or fur growth, while potentially feeding less per day. Complete, nutrition – no additional supplements necessary. Great for rabbits of all ages. Utilizes a constant nutrition formulation process that automatically compensates for naturally varying nutrient levels in ingredients for great nutritional consistency. Uses a total rabbit nutrition formulation system that considers all key nutrients and their interactions with each other to support overall rabbit health.